Since accusations against the Church and Christianity in general are common and frequent, I thought it would be useful to write a response to a letter I received recently. Forgive the extension of my response, but it is important to expose every logical fault and every historical error to make sure that we get as close to the truth as possible. I shall strive to do so. To keep the response reasonably ordered I will group the concepts exposed in this letter to answer them one by one. I will begin by defining some concepts that seem unclear to the author. The original letter entitled “Response to Laboring for Beauty” is printed verbatim in the footnotes. 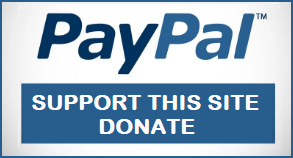 It seems to have been lifted almost in its entirety from Secular Humanism but we shall respond to it anyway. Let us reflect for a moment in the nature, origin, mission and history of the Catholic Church. Most Christian ecclesial groups trace their origins to a founder such as Luther or Calvin, Zwingli or England’s Henry VIII. The general premise for founding these—now numerous—ecclesial groups is the alleged failure or corruption of the original Catholic Church. In looking at the known history of the last forty centuries anyone can see a clear line beginning with Abraham at the edge of the Iron Age, Jesus of Nazareth about twenty centuries later and after that, the Church founded on the twelve original apostles which continues until today: the Catholic Church. Since the very beginning the Church has been composed of all kinds of people. It was predicted by Jesus that saints, fools, sinners, sheep and wolves would be found in her. A simple analysis of Christian doctrine reveals that Christ taught his followers how to fight and defeat the bad tendencies in human nature. The main fight of Christianity does not take place in the battlefields of the world, but in the inner space of the human soul. Christ never told us that every person would become a perfect saint in the eyes of the world by the mere device of joining the Church. The modern detractors of the Catholic Church require of Christians something that not even God requires: immediate, unfailing holiness. A tall order for anyone this side of heaven and a very unfair one in my view. In this letter we are about to analyze, that same demand can be seen without much effort. The author attempts to connect Christianity and the atrocities of World War II and more specifically he tries to blame the Catholic Church for the whole mess. We have heard his argument before: Hitler was Catholic, the Pope did nothing to stop him. Therefore they were in cahoots to eliminate the Jews and complete a whole agenda of unspeakable evil designs. Now, the author is a person born and baptized Catholic just like Hitler and some of his cronies were. Should he commit a despicable crime tomorrow, would the Catholic Church be responsible for that crime? Furthermore, should the Church bear the burden of everyone in history who—having been baptized Catholic—failed to live according to her high moral and ethical standards? I leave you, reader, to give a fair answer to those two simple questions. No matter how we judge the Church in these matters there is one particular issue that deserves everyone’s attention: her permanence in history for now twenty centuries (forty if you count the time it took to develop the Hebrew roots from where she was brought forth). Here we have a unique institution, older than any standing political order in this world. This institution, the Church, is not only ancient, it claims to transcend the boundaries of this world and to be part of something that is other-worldly and offers as proof, her having survived the most brutal attacks and persecutions for twenty centuries. I would say that—survival, by itself—provides a good reason to take a good look at the rest of her claims, especially when we know that she is not composed of the most pure, the most talented or the strongest people in the world. This particular way of observing the Church turns the critic’s demand for total purity on its head. It would not be surprising that a group of decent, talented, strong people survive against all odds for twenty centuries. The amazing fact is—when we look at the Church—that the survival is there while the pure, the talented and the strong are most obviously in the minority! The amazing fact of her survival against all odds should prevent us from taking the claims of the Church lightly. First, the letter I received was supposed to be a response to a previous article:Laboring for Beauty. If I remember well, I did not mention Nazi Germany there and referred to the Church only in passing. Why did he respond to my article by bringing up the alleged faults of the Church during World War II? Is there nothing else to do but to beat this long dead horse? The Germany of Hitler, an overwhelmingly Christian nation? Our critic tries to tie the success of the Nazi movement to Christianity from the beginning by saying that Germany, at the time of Hitler, was an overwhelmingly Christian country. I have often heard that Germany was the most literate country in the world at the time of Adolph Hitler’s rise to power. Based on that premise, one could easily blame education for the advent of the barbaric Nazi regime. In fact, one could blame anything that Germany was or had at the time. In this case, the choice is a vague claim to a Christian majority. Now, how is this connection justified? Hitler, in any case, was not elected by the people of Germany. It is well known that he got to be the Chancellor by a parlamentary deal set in the Reichstag. There was no free election for Prime Minister with Hitler as a candidate. He simply was the man of the hour at the time of a profound economic and political crisis. Now we know what fascism is and we can condemn what Hitler eventually came to be. The people of Germany did not have the benefit of hindsight as we do. Furthermore, we know the first years of Hitler’s regime produced some good results, magnified in part by the catastrophic end of the Weimar Republic. Hitler’s government had at least a veneer of legality and it is not surprising that the Church supported it, just like the German people did. They had no indication of what would come years later in 1939. Christianity had very little to do with that. The truth is, we all dislike chaos and prefer prosperity to poverty and insecurity. Hitler, in the first phase of his government (just like Mussolini in Italy) was able to restore the public order. Anyone of us living at that time would have approved his work. Of course, if the German people would have seen in some crystal ball the ultimate results of Hitler’s madness, they would have rejected him! The early days of Hitler’s regime were for the most part positive; tyranny came later. As the letter continues, the author digs deeper into the supposed Christian support for the Nazi regime. It is clear that Hitler and some of his followers were not friends of Christianity. Hitler appears on record many times on this matter, one I particularly like is: “Islam would have been much more compatible to us than Christianity. Why did it have to be Christianity with its meekness and flabbiness?”  It is true that the Vatican never excommunicated him in spite of his public behavior. Since Hitler was not seeking Holy Communion at the time, the point would have been moot. Besides, there is one aspect of the action of the Church that the author ignores here: the principle of proportional response. We will give some attention to that issue later. It is sufficient to say for now that a spectacular measure like the official excommunication of Hitler, or the repudiation of previous diplomatic treaties would have served no useful purpose. On the contrary, it would have brought about a prompt and violent response from the Nazis. The Pope is not an irresponsible, tough theorist in his ivory tower. He is the pastor of hundreds of millions of souls, and it is his duty to protect them and not go around drawing useless lines in the sand, only to provoke suffering and death on his sheep. It is easy to see why Pius XII avoided useless gestures while concentrating on saving as many Jews and dissidents as possible. His policy resulted in over 800,000 Jews being saved from falling into Hitler’s extermination camps. During the times of the Holocaust, Pius XII had to deal with a huge surge of evil in the world. Once he decided to enter into this conflict he had to make some hard decisions. That is, he had to determine if a good deed (like speaking openly against the atrocities) would eliminate the evil taking place or bring about more evil as a result. Historian Margherita Marchione  reports that, during a private audience with Cardinal Paolo Dezza, in December, 1942 Pius XII mentioned his frustration with some sources that pressed him to speak about these things. Cardinal Dezza wanted the Pope to condemn Hitler’s atrocities. He did not understand that the Nazis were waiting for the slightest reaction from the Vatican to crack the whip even harder. Prudence had been the policy of the Holy See during the Russian Revolution. Now, this was a new enemy with tactics similar to those of the Bolsheviks. Of course, the Pope could not even mention the efforts that were under way to sneak Jews and dissidents out of Germany and the German occupied territories. He kept silent to avoid a greater evil. This decision was not entirely his. The Polish and German Bishops had asked him not to mention the problems publicly to avoid grave retaliation. They had in mind the bloody reply of Hitler to the public letter of the Bishops of Holland. Hitler never responded to that letter with words. Rather he unleashed a brutal deportation against Holland in which thousands of Catholics and Jews died, including Edith Stein and Anne Frank. The Church in Europe got the message. In the meanwhile, inside Rome and all across Europe, the religious houses opened their doors to hide thousands of Jews. In Rome hundreds of Jews were fed by the Vatican daily even during the German occupation period. The Vatican rescued many of them by paying ransom in gold. As a testimony to these well-documented acts of selfless charity, we have the example of the Chief Rabbi of Rome, Eugenio Zoller. On July 25, 1944, Rabbi Zoller was received by Pope Pius XII. Notes taken by Vatican secretary of state Giovanni Battista Montini (who would become Pope Paul VI) show that Rabbi Zoller thanked the Holy Father for all he had done to save the Jewish community of Rome — and his thanks were transmitted over the radio. On February 13, 1945, Rabbi Zoller was baptized by Rome’s auxiliary bishop, Luigi Traglia, in the Church of Santa Maria degli Angeli. In gratitude to Pius XII, Zoller took the Christian name of Eugenio (the pope’s name). A year later Zoller’s wife and daughter were also baptized. At the start of World War II, Pope Pius XII’s first encyclical was so anti-Hitler that the Royal Air Force and the French air force dropped 88,000 copies of it over Germany. This is hardly the conduct of a supporter of Adolph Hitler. Even in the text of the letter we find the statement “The Catholic Zentrum party had antagonized the Vatican during the 1920s by forming governing coalitions with the secularized, moderate Left-oriented Social Democrats.” Number one, the Zentrum was never the “Catholic Zentrum”. At best it was a centrist coalition where Catholics were numerous. Zentrum was never the “Catholic Party”. Zentrum did not wait for cues from the Vatican to act. As the author correctly reports, Zentrum engaged in political behavior not approved by the Holy See. How this could be interpreted as “the Catholics” being “instrumental” in putting Hitler in power escapes me. Let me repeat briefly, that in those early days no one suspected what Hitler would turn out to be. Considering the situation at the end of the Weimar Republic, the National Socialists were the only rafter Germany could grab to avoid sinking into further chaos. They grabbed it willingly not because Catholics “made it acceptable” but because there was nothing else out there but chaos to the right and Communism to the left. The last elections, as the author rightly states, were in 1934. Hitler would only relinquish power to Hermann Göring in 1945, hours before committing suicide. I would venture to say that the German Communist Party was truly “instrumental” in putting Hitler in power, since most Germans did not want Germany to become another Russia. The Concordat has to be understood in the context of the times. In 1933 fascism was mostly untried as a political system. Communism, however, was looming in the East and the preoccupation of the Church was to contain it before it encroached in the very heart of the continent. Germany, of all the European countries, had the most active Communist Party and, perhaps, the most numerous. The man who would negotiate the first Concordat with the Kaiser, was Msgr. Eugenio Pacelli, who later would become Pius XII. The Concordat was signed first with Bavaria in 1925 and was an effort by the Church to secure freedom to profess the Catholic religion. It was never a dispensation or an approval of the Kaiser’s regime or later, of Hitler’s regime. In both cases the Church simply tried to insure a degree of freedom for her faithful. After the assassination of governor Kurt Eisner in 1919, most political and religious figures left Bavaria, but not Cardinal Pacelli who remained popular and well liked until he was sent to Berlin in 1925. At the time of his departure, the streets were lined with well-wishers waving at the Papal Nuncio. They expected that a new Concordat would be signed shortly and that the new Nuncio would further the rights of Catholics to educate their children in the faith and worship in peace. That agreement was reached in 1929, although the Nazi Party violated its terms only a few weeks after. Even so, the Nazis were not considered a danger at the time. The real danger was that posed by the Communists, that had taken over Russia and were persecuting and killing Christians. The Fascists in Italy and the Nazis in Germany were, at the time, the strongest anticommunist options. Allow me to remind you that World War II would not start until 1939. If one considers the Nazis and Mussolini at that time, it was the latter that was the most virulently anti-Catholic (at least in his rhetoric if not in fact). Put between a rock and a hard place, the Church chose to focus on exposing error and teaching against it. They could not create an alternative political option to the forces in play in Europe at that time. Only the United States and their Allies, after a bloody war and two decades of virtual occupation of Western Europe, were able to eventually force the Continent to look beyond the extreme options that brought about the war. How could anyone expect the Pope to have achieved that goal by merely chastising those beastly regimes? —To flatly oppose all human institutions, “organization,” whether government or religion is not prudent. Only a free, wise and moral people will provide a watchful assent to either. Religion has preceded the state in moral and intellectual formation of societies since the dawn of time. Without moral restraint, no society can ensure order other than by terror and force. —As numerous 20th century scholars have made clear, religion (cult) is at the center of every culture known to man. Without an adequate “organized religion” to oppose government, all governments take on themselves the attributes of organized religion. Is there anyone out there who has heard of Hobbes’ Leviathan? —Separation of church and state exists more fully under Christianity than under any other religion. A Church fractured by the Protestant Reformation kept all German Christians from speaking with one voice. A united Church could have provided a stronger opposition to Hitler when he finally showed his true colors. —Bismarck began the process of expunging Christianity from the German culture in the 1870’s. His attempts to eliminate the political and cultural strength of the Roman Catholic Church within Germany—the so-called Kulturkampf—was partially successful. His similar struggle against Social Democrats (Sozialistengesetze) was unsuccessful, although under his governance Germany enacted what was, at the time, progressive social legislation. Germany was, hence, very secularized by the time Hitler came to power. Marxism had become a kind of religion of the left, with the Jews playing the part of the scapegoat. —To say in any way that Germany was strongly influenced by the Catholic Church, flies in the face of all sorts of historical evidence and eye-witness commentary. If Martin Heidegger was a Catholic, I am the pope! As for the other guys, anybody can call himself Catholic. Don’t we have “Catholics” in the American Congress that support abortion? Since when every Catholic is politically responsible for what any Catholic does individually in opposition to the doctrine of the Church? —As far back as 1891, Leo XIII in Rerum Novarum condemned socialism. —Both Pius XI and XII spoke out strongly against communism and socialism along with all forms of totalitarianism. Nazism is a form of socialism, German national-socialism. Please see the famous papal document Mit Brennender Sorge. —In 1937, in both Atheistic Communism and Mit Brennender Sorge Pius XI explicitly condemned socialism, including National Socialism though not by name. The “not by name” was very wise. As Stalin said “How many legions does the Pope have?” Pius XII did not have any means of physically protecting those that could be exposed to retaliation by the Nazis. He remembered well what had happened in Holland when the bishops there spoke out strongly after the Nazi invasion. It is obvious that “Mitt Brennender Sorge” was aimed at the Nazis, it was composed in the German language and specifically distributed to the German bishops (with accompanying instructions that it was to be read to the faithful in all Catholic Churches). —The prudence exercised by Pius XII allowed the Church time to save 800,000 European Jews from almost certain extermination. Why, in view of all the good things said about Pius XII by prominent Jews, did the KGB and the liberals of the world begin a campaign of lies against the Church and the Pope? For those interested in reading more about the origins of the legend of “Hitler’s Pope” there is an article written by Ion Mihai Pacepa: Moscow’s Assault on the Vatican: How the KGB made corrupting the Church a priority. The author of the letter explicitly refuses to back up his assertions with historical data, quotes from authoritative historians, or other respected sources. His letter borrows heavily from the webpage of Secular Humanism even to the point of respecting the original’s misspellings! The copy and paste nature of this essay is only one of its minor faults. Intellectual dishonesty comes in many shapes and forms but this is not one of its products. No danger of confusing the author with a “full-time academic” either, not just because of the conspicuous absence of documentation and his frontal contradiction of known history but for his candor in admitting that his writings are a product of his bias. His writings are a mere opinion, a rant against things he dislikes. Don’t bother him with the facts! Please see the illustration and corresponding footnote. Germany: Nazi Vote and Catholic Population Comparison. But why? What is his problem? Perhaps the Church has not done anything for him lately. There are many, especially those of the liberal persuasion, that would like to see the Church gone. They do not want even the mere presence of “organized religion” to challenge their particular choices in life. They desire a world without a moral point of reference other than themselves. But, why does the Church bother them? Is the Church rallying in front of their homes asking them to behave in a Christian way? Certainly not. What bothers them is the mere existence of the Church. Just as sunlight can hurt a drunk suffering from a bad hang-over, so does Christian doctrine hurt those who still have a little bit of conscience left in themselves. Ever since the times of the German Reformation, there have been increasing numbers of attackers who wish to vilify and demonize the Catholic Church. In the beginning I called attention to the fact—the irrefutable fact—that the Church has been standing there longer than any other human institution, like a rock. She has never lacked powerful enemies or time to bury them. The Roman Caesars are gone, and so is their proud Empire; the Illuminists are gone, their philosophies largely replaced by newer and even more radical ways of thinking; Napoleon is gone and so are Hitler and Stalin… gone with the wind of history never to return again. And the Church is still there, with her human frailties, her failures, her great triumphs and disasters, saints and sinners. The permanence of the Church is a mystery that can only point to her transcendence. It flourishes in the world because it is not of this world. If therefore there is another world, then this reality where we live, sooner or later will reveal itself to us, at the final moment of our lives or—alas!—in that unimaginable minute when we reach the end of time. Nothing can prick the conscience of the materialist or the hedonist as much as that huge mountain that refuses to fall and can’t be hidden from sight. For them it is imperative to dispel that vision by any means. Little do they know that they are fighting against themselves, against the remnants of that still voice that calls them home to peace and rest. The moment when that voice is heard no longer, the mountain will still be there, not as a sign of hope but as the measure of the depths of doom. Righteous Gentiles: How Pope Pius XII and the Catholic Church Saved Half a Million Jews from the Nazis (2005), Spence Publishing. Ronald J. Rychlak, MDLA professor of law and Associate Dean for Academic Affairs at the University of Mississippi. Pope Pius XII: Architect For Peace, Margherita Marchione publ. Gracewing, 2000. The Myth of Hitler’s Pope: How Pope Pius XII Rescued Jews from the Nazis by Rabbi David G. Dalin Washington, D.C. Regnery Publishing Co.2005. For those of you reading too quickly: I am being sarcastic. Figures A and B. 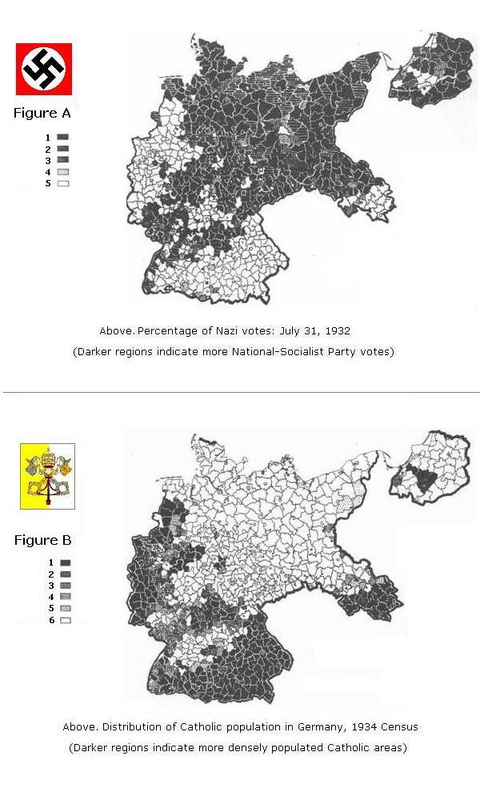 Interesting comparison showing the distribution of Nazi votes and Catholic population. It is obvious that the more Catholic the area, the less likely it was to support the Nazis. Catholic Population: The darker areas indicate more Catholics live in a zone. Notice the South: Bavaria, in most of the territories traditionally Catholic, likewise the Middle of Germany Protestant Strongholds. Pay special attention to northwestern part of Germany, Eastern Prussia, Prussia being traditionally Protestant except from that dark area in the middle, the Ermland. The darker the more Catholic the whiter the more Protestant, one qualifier is that among Protestants, nominal “Christianity” was, and still is, way more rampant.